I’ve always loved writing, but before this year I never took physically writing my thoughts into consideration. In this era of technology and smart phones I always turned to the notes section of my phone and spilled my thoughts. It was never a regular habit and just something to do when I felt the need. At the beginning of the year I decided to buy a journal, I figured I’d give writing my thoughts a try to see how I would feel. After the initial excitement of having a new pretty journal wore off so did my enthusiasm to write. I would find myself reflecting every month, then every few months, then not at all. Last month I sat down and began writing and remembered how good it felt to get my thoughts out without having to vent to another person. I learned that my journal is a source of self-therapy, self-care and a way for me to reconnect my body, mind, and spirit. Writing almost always improves my mood and leaves me feeling serene, upbeat, and centered. I think one of the toughest things with self-reflecting and journaling is actually finding a place to start. I didn’t give myself a writing prompt I simply started writing based on what was clouding my mind at the moment. I reflected on my day, the week, certain situations, and wrote about how they made me feel. I asked myself “How do you feel?” and other times I wrote the words I needed to hear in order to motivate and inspire myself. 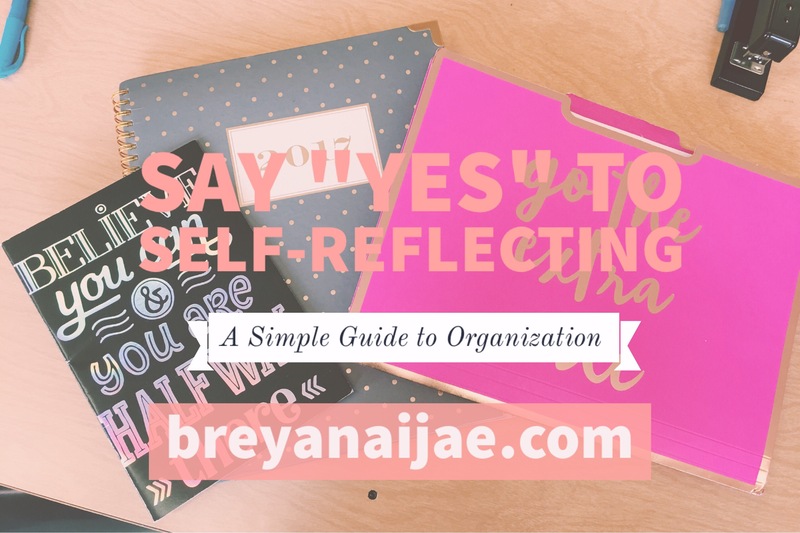 My experience with self-reflecting has been amazing and I owe a large part of my growth to it. You learn a lot about yourself when you take the time to sit down and get acquainted with the person holding the pen. I’ve tapped into parts of myself I never knew possible. You learn that all of those days of venting slow down and the first person you need to vent to is yourself. It’s also a good way to organize your thoughts, life, and mind. Personally, it’s helped me to become less negative and to develop a more positive outlook on life. I’ve become more aware of me as a person/individual, I’ve become more aware of those around me. Self-reflecting gives you the opportunity to rid yourself of negative thoughts/attachments, past situations, and will help you reach a peaceful state of mind and gain clarity. Your journey of self-reflection will not be the same as mine. You will write based off how you are feeling, how you want to feel, and what you are going to do to make sure you stay centered and productive. Those things vary individually. Or maybe you’ll write a to-do list, construct a list of goals, etc. who knows? The world is yours to conquer. If you need a push to begin writing there are millions of journal prompts circulating around the internet, but if you sit down long enough your thoughts will write themselves. It’s simply a way to tune into your emotions, and to allow yourself to feel with a outlet to put those emotions into place. If you ever find your mind jumbled with thoughts, sit down and let them flow. So let us embark on a journey of self-reflection and rid ourselves of the things that are holding us back. Have a talk with yourself as crazy as it sounds, the answers we seek are within 10/9. Be blessed, and be the energy you seek, don’t let anything or anyone steal your happiness today. Today, I challenge you to take a few moments to disconnect yourself from the outside world and spend some time with yourself. The only control we have is over ourselves, stay elevated and trust in your journey.